Home Automation – Security Alarm / Fire Alarm – How Can They Work Together? Household Automation explores how British Standards allow for a security alarm to act as a fire alarm. 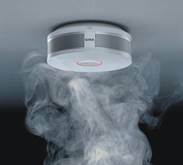 Most security and home automation systems are able to connect to smoke, heat and CO detectors to provide warnings of fire, Household Automation explores the viable possibilities using British Standard BS 5839-6:2004. Most of the major fire detection equipment manufacturers such as AICO and Hockiki offer a range of detector heads that can be connected using 9-24V power from a home automation or alarm panel and provide NC or NO contacts to enable an alarm. In practice this may be very easy to physically achieve but under what circumstances is this allowable? The details of what is allowable is defined in British Standard BS 5839-6:2004 Fire detection and fire alarm systems for buildings. A home automation or security system that is used as a fire alarm is classed as Grade C.
A Grade C system is allowable in a three storey or less single family dwelling and shared house with no floor greater in area than 200m/sq (2,152 sq/ft). A Grade C system is allowable in a bungalow, flat or other single storey family dwelling or shared house with one floor greater than 200m/sq (2,152 sq/ft). So now that we have established where the home automation or security alarm can be used as a fire alarm what are the key points that we need to know in order to comply with a grade C system? The fire alarm system has to be defined by category and grade and documentation (sample certificates provided at the back of the standard) provided upon commissioning. Battery life – section 15.4 specifically has notes relating to extended standby battery life of 72h (which is a greater requirement than a standard security system). Sounders should comply with section 13 – notably 75 dB(A) at the bed head. Control and indication – the standard suggests that grade C systems may have more sophisticated means of control comparable with grade A and B systems, its indicates that there is a need to ensure that the system is not compromised as a result of casual tampering with the control and indicating equipment (section 17.1). Further section 17.4 provides greater details of illuminated indicators and audible warnings. In reality if you are using a home automation system as a fire alarm you need to read and comply with the whole of BS 5839-6:2004. As with any standard there are sections that are very clear and precise and others that are open for interpretation. BS 5839-6: 2004 does however clearly allow the use of systems other than fire alarms to act as fire alarms. This article is by no means comprehensive; we have provided an overview of what is possible. We strongly recommend that anybody looking at installing smoke / fire alarms using a home automation or security system as the main control and interface panel should obtain and comply with the recommendations of BS 5839-6:2004. Household Automation Ltd has ongoing projects involving the installation of a variety of home automation equipment. We have used the Comfort home automation system as a fire alarm and can provide details of the types of system that would be appropriate for your home. The use of the Comfort system allowed the customer to set up dial out to his mobile (or tel number of his choice) as well as overall control from iPhone or iPad.